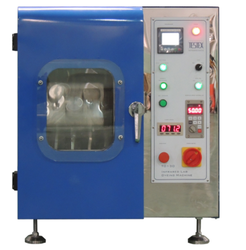 Our range of products include ir dyeing machine. We are one of the well-known manufacturer, supplier and trader of IR Dyeing Machine. The offered infra-red dyeing machine is very widely used in the industrial dyeing processes. Our offered dyeing machine uses the infra-red light for the dyeing process. The offered dyeing machine is capable of fast and flawless dyeing operation. Our offered dyeing machine is available at very cost effective rates. Looking for IR Dyeing Machine ?